Stovetop popped popcorn is easy, but it's not particularly forgiving - meaning that you do need to be precise with the tools you use and your measurements. Note: The pot you choose is kind of important. The ideal pot or pan is not deep like a stock pot, has thin sides (so, not your Dutch oven), and a large surface area. A large frying pan is ideal. However, if you don't have the ideal pot, rest assured you can still make popped corn in whatever you have. Heat the oil and a few popcorn kernels over high heat on your stove. Cover with your lid. Wait for the popcorn kernels to pop. Once your kernels pop, remove the pan from the heat and remove the kernels from the pan. Add the rest of the kernels to the pan. Stir the kernels so they are covered with oil and then wait about 20 seconds. Return pan to the stove and cover with the lid. Make sure the heat is high - and shake the pan every 20 to 30 seconds so everything gets popped. Allow the kernels to pop, and be forewarned, they might push your lid up. Once kernels start popping more than 10 to 20 seconds apart (this takes about two minutes), remove the popcorn from the stove. You may want to let it sit for a few minutes so that the very last kernels can finish popping. Pour into a bowl and then use your hot pot to melt butter. Add salt and butter to taste. Stovetop popcorn is easy to burn. The first step of letting a few kernels pop helps you know when the pan is hot enough to pop all your popcorn. If you skip the first step, you will inevitably end up burning the kernels that pop first. When you take the popcorn off the stove, make sure to remove the lid right away. Otherwise, you will end up steaming your kernels and have a soggy mess of popped popcorn. Heirloom popcorn has a wide variety of flavors if you're tired of the old movie-theatre-style popcorn. If you're really concerned that you do not have a suitable pan, you can buy a pot specifically designed for making popcorn. European butter will give your popcorn a very yellow look, similar to movie theatre popcorn. Tired of plain butter and salted popcorn? Caramel popcorn is decidedly less healthy but very tasty. Popcorn makes a great and economical snack. Unless it's absolutely laden with butter and salt, popcorn is also a whole grain and a fairly healthy snack. 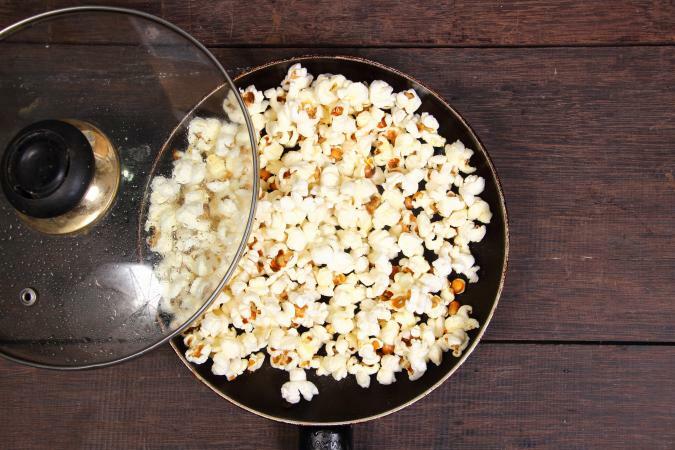 Thankfully, you don't need a popper to enjoy popcorn, so why not try some on your stove today?